A person who has had the pleasure of seeing the innards of a pump (opened by their own hand or glancing over the shoulder of a technician) may have noticed it looks simpler than expected. After all, the pump is this piece of machinery that can pump 80 gallons or more a minute, leaving one to expect a few bells and whistles hidden away inside the casing. 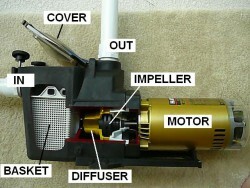 But in practice the pool pump can be broken down into two categories of parts; the drivetrain and the outer structure. Or put simpler, the parts that push and pull the water and the ones that keep it from leaking. 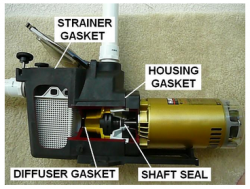 Today’s blog is centered on identifyiing pool pump parts, so Average Joes can either fix it themselves or at least use the right terms when talking to a tech. A sidenote, before I learned how to drive, my grandfather demanded I know what the basic parts of the car were and their function before I could get behind the wheel. That mindset was to impart two points: 1) Understand how my machine works so I can utilize it, 2) If I pay someone to fix it, know if they are trying to cheat me on parts. The latter is the most important to me as someone who appreciates an honest repairman. 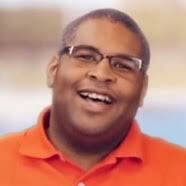 And not the least of which is an honest pool equipment technician. My grandfather passed on the lesson of knowing the mechanics before the drive, so I want to pass on that same lesson to you. So let’s break down the parts of a pump and see how they contribute to the overall functionality. If the pump is thought of as a ship, the housing would be its hull. All of the pump’s inner workings – the impeller, diffuser, seals, and motor – fit in or onto this outer casing. The standard housing material is currently the high impact plastic composite called Noryl. This resilient, lightweight material is rustproof and holds up extremely well under duress from heat, rain and water pressure. Older pumps (early 80’s and back) were made of brass or bronze; these materials proved to be extremely durable, but costly to maintain. A plastic injection molded impeller is going to be a bunch cheaper than a brass version that has to be smelted and forged. Also, your back should thank pump manufacturers for switching to plastic because those metal pumps weigh upwards of 100 pounds. Metal pumps were really durable workhorses and can still be found on pools today. The strainer lid is the pump’s main inspection point from which a tech or homeowner can determine a system’s health. If we find large air bubbles or no water at all in the strainer lid while the pump is running, that could be a sign of an air leak along the suction side. Because of its necessity as an inspection point, the lid is made of a clear or tinted Lexan glass. If you are unfamiliar with Lexan, it is the material used in bulletproof windows and other glass-like materials. The strainer basket collects debris before it reaches the important parts of the drivetrain. This basket can save you a bundle just by preventing hard debris like pebbles from surging into the pump and chipping the impeller. Lid Gasket – located on or under the strainer lid. Diffuser Gasket – Found on the cone tip of the diffuser. Housing Gasket – Largest of the gaskets and found in the seam between the main housing on the motor seal plate. 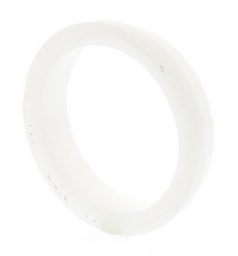 This gasket is also called seal plate gasket. Shaft Seal – The two sided seal that sits underneath the impeller on the shaft of the motor. This is the most important seal as it prevents water from surging into the motor and causing fatal damage. The seal plate is a motor’s mounting flange that allows it to be secured to the pump housing. The seal plate is named so because it houses the shaft seal that encloses around the shaft to prevent water leaks into the motor. This is made of the same Noryl plastic as the housing, making it lightweight and super strong. The driving force behind the pump is its motor which creates the churning force necessary to prime the pump and circulate water. The standard is single speed induction motors, but they are slowly losing ground to dual speed and variable speed motors. Variable speed and dual speed have grown into popularity due to their energy efficiency and have also been boostered by electric companies offering rebates for homeowners who choose to upgrade. 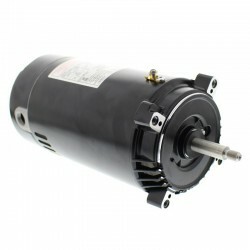 Most single speed motors run a dual voltage setup which allows them to run on either 230 or 115 voltage (user must adjust voltage before installing). Variable speed and most dual speed run strictly on 230 voltage; there are some exceptions in the dual speed category that run on 115. The impeller is what makes all the magic happen; magic meaning, transforming the spinning shaft of the motor into the pulling force for pumping. An impeller is essentially two discs glued together to sandwiching fan blades (also called veins). The front disc has an opening with a porthole to focus the churning power of the impeller towards the suction pipe to the pool. The water is pulled through the impeller face and then expelled through the impeller’s slotted sides – it’s H2O’s version of a merry-go-round. The water is then rushed back to the pool. We call this an impeller accessory and a very important one at that. A diffuser amplifies the pull of the impeller by creating a tightly enclosed vacuum lock to the front housing to maximize its power. The diffuser resembles a funnel or a cone that shrouds the impeller; its tip butts up to the front housing, sealed by the diffuser gasket. As the impeller spins, the diffuser shroud concentrates the turbulent energy of the impeller towards the suction pipe which makes the pump prime. 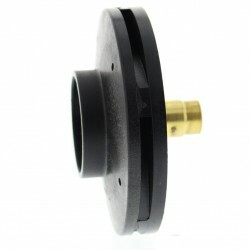 The impeller ring, aka the wear ring, is a plastic ring that fits to the tip of the impeller. The purpose of a wear ring is to act as an extension of the impeller tip to ensure a seal between the impeller and diffuser. The centrifugal force of the impeller forces the wear ring to affix to the diffuser to ensure an even tighter vacuum for priming and pumping. Wear rings are not found on every pump style but are usually seen on high pressure and high head style pumps, i.e. Hayward Super II or Pentair Challenger. Hopefully, you have read my previous blog concerning the importance, or better yet unimportance, of the impeller screw. The impeller screw is meant to secure an impeller to internal threaded shaft motors. The impeller screw is quickly becoming obsolete as most manufacturers switched to external thread motor shafts. This change to external threads allows for the impeller to be screwed directly to the motor shaft without the need for extra securing. The thread type of the new impellers also means the impeller is being spun in the direction that keeps it tight to the motor to prevent any slippage. Thank you for your time and hopefully you learned something about your pump. If you’re still in need of more information, please do not hesitate in calling our techs at 877-372-6038. We’re glad to help. I need to know the name of the part that the motor that runs the in pool cleaner attaches to. It sounds like you are talking about a Booster pump. Does your pump look like this? Polaris Booster Pump – PB460. If so then the parts and their names are listed below the picture.